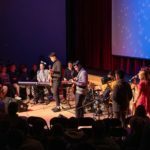 The New Hampton School community gathered Thursday, March 28 to celebrate all of our winter athletes and teams in their efforts and sportsmanship. In addition to the school’s awards, several of our winter student-athletes received league award recognition. The students below were recognized for their exceptional leadership and skillful contributions this season. Congratulations to all of the student-athletes who participated in winter sports! Photographs from the evening’s festivities are available on Flickr. Coaches Bo Cramer and Keon Burns, of the Men’s Varsity B Basketball team, presented awards to David Henriquez and Charlie Raisin. 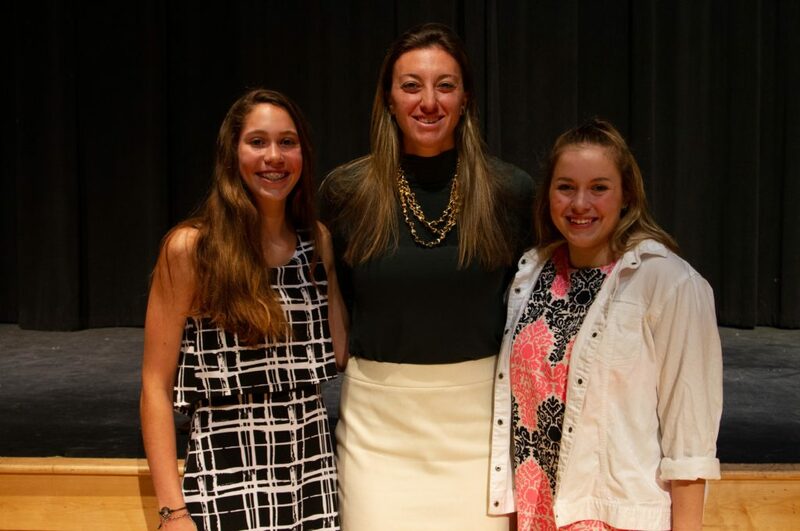 Women’s Basketball Head Coach Brett Benzio presented awards to Seraphina Hodgson and Madison Kilfoyle. * Awards to be announced at a later date. The Gall Hockey Award honors brothers Peter (’49) and Bill (’50) Gall. Although the pair never took to the New Hampton ice during the same season (a broken arm sidelined one of the Gall boys), each made a significant contribution in the early years of New Hampton Hockey. Later, in collegiate action, the pair went on to set the record for the highest scoring line at Princeton University. The Gall Hockey Award recognizes that outstanding player who has contributed, not only to the team but also to the legacy of the New Hampton School’s hockey program. In 1976 the parents of that year’s hockey team established this award to honor that player who contributed the most to the success of the team but was not necessarily the most talented skater on the ice. It is intended to go to that player—through sportsmanship, leadership, and work ethic—who sets the standard by which the rest of the team must compete. This award is presented to that player whose love of hockey, respect for the game and their opponents, and determination to play with pride, dignity, and through adversity have distinguished them as a person of excellent character and as a goodwill ambassador for the sport of hockey and New Hampton School. 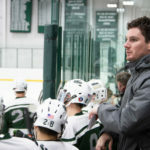 It is established to honor the efforts and sportsmanship of the 2003-04 Men’s Varsity Hockey Team, players and coaches. During New Hampton’s first season of women’s ice hockey competition, Alison Paul emerged as the star of the team. Like her fellow teammates, Paul relied on her competitive spirit and love of the sport to override her lack of experience in the face of more seasoned opponents. The Paul Family Women’s Ice Hockey Award recognizes that female hockey player whose competitive spirit and good sportsmanship have contributed to furthering the success of New Hampton’s Women’s Ice Hockey team. 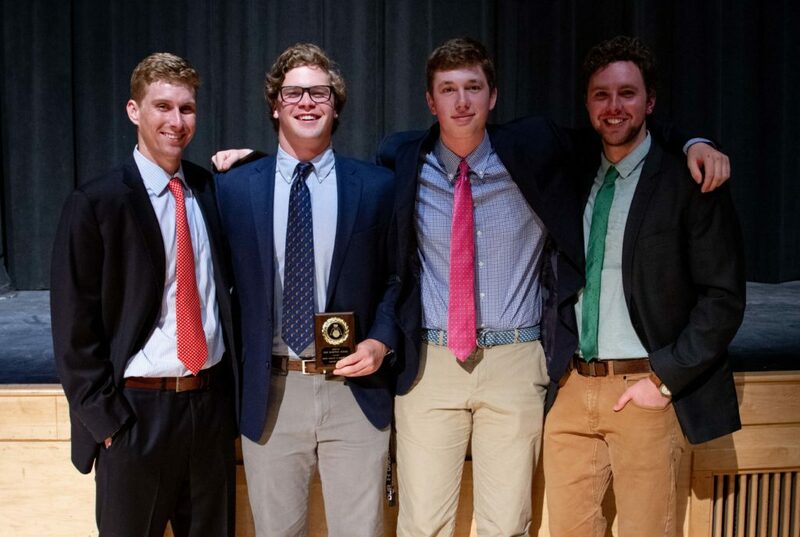 This award for the outstanding member of New Hampton’s Varsity Ski Team was established by former math department chairman and head ski coach, Peter Bixby. 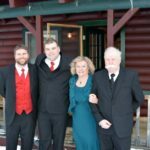 Bixby, who was responsible for the development of New Hampton School’s ski area on Burleigh Mountain, was committed to the skiers he coached and demanded the same dedication for his team. This award recognizes that skier whose performance was the result of a strong commitment to the team and him/herself. In 1986, New Hampton School won its first New England Prep School Class “A” Basketball Championship. This achievement became a reality due to Head Master Lou Gnerre’s efforts to develop a national-caliber program. Gnerre’s enthusiasm and commitment to New Hampton basketball helped create a program which became second to none. In acknowledging Gnerre’s vision and giving thanks for his efforts, this award was established to recognize that player who best exemplifies that competitive spirit and class, on and off the court, which Gnerre envisioned as the foundation for a winning program. The Richardson Basketball Trophy was established by the family of alumnus and former trustee, Don Richardson, who distinguished himself as a great athlete during both his New Hampton and collegiate basketball careers. As an alumnus, he continued his interest in the New Hampton basketball program as a loyal fan. The Richardson Basketball Trophy is awarded to that basketball player who exhibits both superior athletic skills and a dedication to the team. This award was established by Dr. J. Vazifdar, stepfather of Carrie Richard ’81. Carrie attended New Hampton for three years and was a major contributor to the women’s basketball program. Besides being a starter on an exceptional basketball team her senior year, Carrie also received the Valedictorian Medal as the top student in her graduating class. Carrie continued her basketball and academic excellence at Ohio Wesleyan University. Dr. Vazifdar established this award to recognized that student-athlete that exemplifies everything Carrie strived for while playing basketball at New Hampton: leadership, improvement, and dedication.